Celebrate the return of spring (it's a month away!) by making this DIY recycled bottle cat planter. While looking at the pile of soda bottles in my recycling bin, I wondered if there was anything I could do with them besides just tossing them. 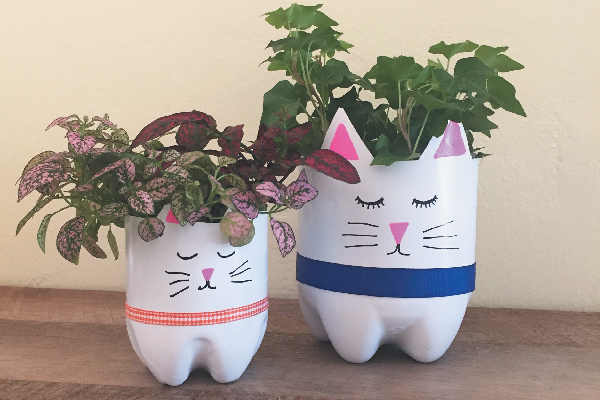 After a quick internet search, I found the perfect project — a recycled bottle cat planter! These planters are cute and easy to make and add a nice touch of green to your home. Rinse out the bottle, and remove the label. Some labels can be a bit stubborn when removing them, so if you can’t get it all off, just keep that part at the back of the project. Draw your kitty outline so you know where to cut. You’re basically cutting off the bottom third of the bottle to use, including two triangles for the ears in front. I used the X-ACTO knife to puncture the bottle, then just slid the scissors in to cut out the kitty outline. Paint the bottle with the spray paint. I used two coats. Once the paint is dry, it’s time to draw the kitty face. I used a black paint pen for the eyes, mouth and whiskers, then used a pink one for the nose and ears. Some soda bottles have a line that runs across the bottom. You can use the ribbon to cover it up. The trickiest part about this project is drainage for your plant. You can either drill small holes in the bottom and use a little plastic dish to collect the water, or you can fill the bottom with loose gravel so the water doesn’t rot the roots of the plants. If the plastic container the plant comes in will fit, you can also just stick that right into the planter. Plant the plants, and you’re all set!